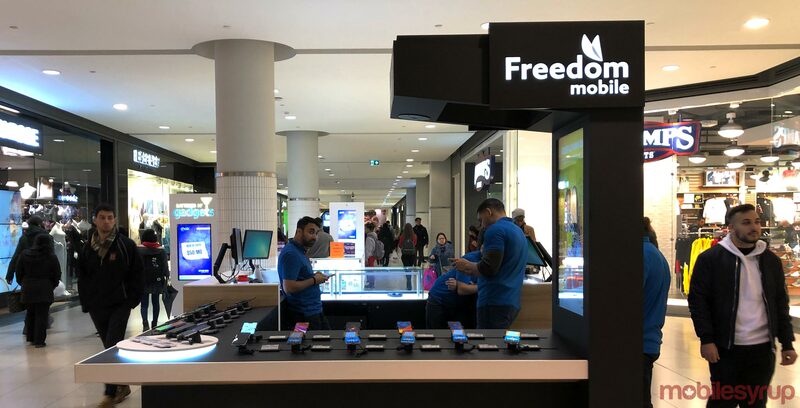 Not content with potentially instigating one late-year pricing war, Toronto-based regional service provider Freedom Mobile has quietly launched a 15GB and 30GB ‘Big Binge Bonus’ promotion alongside its larger 100GB promo. The 30GB promotion is available to new and existing subscribers who sign up for a new handset on a two-year $50/6GB plan with talk or a $50/10GB plan without talk. Both of Freedom’s $50 plans provide much of the same features, with the distinction being that the ‘Big Gig + Talk’ variant only provides 6GB of monthly data and allows subscribers to make unlimited outgoing and incoming Canada-wide calls, while the ‘Big Gig’ variant provides 10GB of monthly data and unlimited incoming Canada-wide calls. In contrast, the 15GB promotion is available to new and existing subscribers who sign up for a two-year $40/4.5GB monthly home plan with a new handset. Freedom Mobile’s $40 promo plan provides subscribers with 4.5GB of monthly data, unlimited Canada-wide talk, and unlimited global text when connected to the carrier’s ‘Home’ network. When using Freedom’s ‘Away’ network, subscribers will have to pay $0.05/MB for full-speed data, as well as $0.15/min and $0.05 for global texts and texts to Canada. Freedom Mobile doesn’t charge overage fees on any of its plans when subscribers consume their monthly data allotments, but the carrier does throttle wireless speeds after subscribers run out of data. The Big Binge Bonus promotion, therefore, allows subscribers to access an additional well of wireless data once they run out of their monthly allotments. Additionally, Big Binge Bonus data doesn’t expire so long as subscribers maintain a Freedom Mobile account, though it’s worth noting that once a subscriber consumes all of their Big Binge data, the 15GB, 30GB or 100GB allotment will no longer be available. According to a counter on the Freedom Mobile website, the carrier’s Big Binge Bonus promotions — as well as its other Black Friday deals — will expire in seven days on November 26th, 2018. MobileSyrup has reached out to Freedom Mobile for additional information. This story will be updated with a response.